The ENESCO QUARTET was founded in 1979; wishing to honour the memory of the illustrious George ENESCO (1881-1955), they gave his name to the ensemble. Their meeting with such distinguished personalities as Sandor Vegh, Norbert Brainin and Sergiu Celibidache was of paramount importance: the ENESCO QUARTET has risen to international prominence ever since the beginning of their studies with these great musicians who shared with them a privileged relationship. They have a very large repertoire containing a great number of quartets as well as numerous other works ranging from quintet to octet, representing 18th and 19th century scores belonging to classicism and romanticism, as well as 20th century music, which occupies an important place in their programmes. They have created in first performance a large number of contemporary string quartets composed by: Philippe Hersant, Serge Nigg, Henri Sauguet, Jean-Jacques Werner, Pierre-Max Dubois, Nicolas Bacri, Nicolas Philippot, Jesus Guridi, Xavier Montsalvatge, José Peris Lacasa, Carmelo Bernaola, Josep Soler and José Garcia Roman. Among these composers, many have written especially for the ENESCO QUARTET. The ENESCOs are regularly invited in such famous festivals as Besançon, Prades, La Chaise-Dieu, Montpellier, Paris, Sully, Cannes, Barcelona, Santander, Granada, Stavelot, Eschternach, Kuhmo, Guilford, Basel, Bucarest. On many occasions they have played with outstanding artistes like: Olivier Charlier, Luis Claret, Jean-Philippe Collard, Patrice Fontanarosa, Youri Egorov, Pascal Gallet, Ivry Gitlis, Michel Lethiec, Roberte Mamou, Paul Meyer, Aurèle Nicolet, Marielle Nordman, Régis Pasquier, Jean-Pierre Rampal, Mstislav Rostropovitch, Michel Strauss, Gabriel Tacchino, Haruko Ueda, Jean-Claude Vanden Eynden, Narciso Yepes, etc. The ENESCO QUARTET has played in the most famous concert halls around the world: Salle Gaveau, Salle Pleyel and the Théâtre des Champs-Elysées in Paris; Teatro Real and Auditorio Nacional in Madrid; Fondacion Gulbenkian in Lisbon; Concertgebouw in Amsterdam; Wigmore Hall in London, The Library of Congress in Washington, among others. The Quartet is constantly invited for master-classes to France, Belgium, Spain, Switzerland and Finland. They have made a great number of records in France with Arion, Pierre Verany, Forlane, Rem, in Spain with Claves and Ensayo, in Switzerland with Novalis, in Germany with CPO. They have recorded Schubert, Schumann, Dvorak, Boccherini, Cherubini, Debussy, Ravel, Franck, Chausson, Enesco, Vierne, Janacek, Bartok, Shostakovich, and Guridi. In 1986, in Spain, their recording of the two Quartets by Guridi was nominated Best Record of the year . In 1989, the record containing “Three quartets of French contemporary music” by Serge Nigg, Philippe Hersant and Nicolas Philippot was awarded Le Grand Prix de l’Académie Française du Disque . Le Diapason d’Or 1994 was awarded to the ENESCO QUARTET, for their recording of Franck and Chausson with Gabriel Tacchino at the piano. They enjoy the rare honour of being regularly invited to play on the quartet of the Stradivarius instruments – unique in the world – belonging to the Royal Court of Spain. Under the title Rewarding Music published in the Manchester Evening News , Robert Beale writes: “ Their playing has a vigour (at times, fury) and sweetness (at times, insinuation) which are none too common, and though these qualities may not be everyone’s cup of tea, they certainly make a change ”. In an article published in the Figaro , the famous musical critic, Pierre Petit, called the members of the quartet “ The messengers of poetry ”, as he was writing about their “ warmth and virtuosity ”, to conclude : “ the ENESCO QUARTET is definitely a great quartet ”. The ENESCO QUARTET will celebrate their 40 years of musical activity in 2019. During the two past seasons the Quartet has played at the Royal Palace in Madrid several concerts on the quartet of the Stradivarius instruments, invaluable instruments belonging to the Royal Court of Spain, which the Enesco Quartet has been playing for 30 years. In Paris, the ENESCO QUARTET has created in world premiere the first Quartet by the composer Fabrice Gregorutti, work which a month later, was followed by a CD recording. Soon after, they interpreted in world creation the second Quartet with soprano, as well as the third Quartet, by the same composer. After a series of concerts and master-classes in France, the quartet performed several concerts in two concert tours in Germany and took part in the Koblenz and Osnabrück Festivals (Germany). In May, “Kuhmo in Paris” then in Finland in July for the Kuhmo International Chamber Music Festival, where they have been invited for the tenth time consecutively. Here they met the composer Krysztof Penderecki and played his 2nd string quartet. They also met Magnus Lindberg and played his Piano quintet in his presence. In autumn, after concerts in the center of France and playing in the French – Russian Festival in Paris, the ENESCO QUARTET will go on a tour to Luxembourg, the Netherlands (Concertgebow-Amsterdam), and in Belgium. In the season 2017-2018, concerts and tours are scheduled in France, Germany, Italy, Portugal, Finland and South Africa. After their prestigious Grand Prix du disque, the quartet has continued the cycle of recordings. 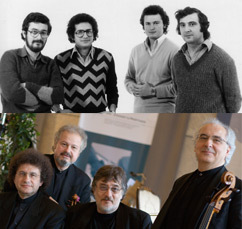 At present the quartet has completed a Shostakovich CD (1st to the 7th quartets and the Piano quintet) , and they have equally created the last quartets composed by José Peris Lacasa, “The Postnuclear Winter Scenario” by Jakob Tel Veldhuis, “Tenebrae” and “Last Round” by Oswaldo Golijov. The world creation of the “Fantaisie” for quartet by Vladimir Mendelssohn met with a great success in South Korea and in Scandinavia. The prospects for 2017 and 2018 include the Ravel Quartet played in his home-town (Monfort-L’Amaury), the cycle “Music and Passions” in Paris, concerts in the Palazzo Contarini-Polignac in Venice, and in Antwerpen in the Day dedicated to the composer George Enesco they will perform string quartets, the piano quartet and the octet. Rare enough to mention, the ENESCO QUARTET has been invited for the 25th year without interruption to play in the prestigious Chamber Music Cycle of the “Ramon Areces” Foundation in Madrid, Spain.